Discussion in 'Completed Pin Sales' started by MerlinEmrys, Jul 26, 2018. A couple as in 2? No worries. I can usually grab 10 at a time. So if the list stays thin closer to the date, feel free to request more. Can you put me down for MNSSHP Chip and Dale and MNSSHP Orange bird? An Orange Bird pin please! Im tempted by the mystery packs, but I bet Hades, Facilier, and Frollo could be gotten afterwards for less than the cost of 20 bags! Yep, see I told you. I need an Orange Bird AP pin. DeputyDonald and MerlinEmrys like this. That's my logic ATM too. Although higher resolution photos may weaken my resolve. I’m waiting for the DLR ones to drop. The previewed ones look good! Please add the Stitch MNSSHP pin to my order. Merlin please put me down for a Halloween party logo pin witht the year. Thank you! We are updated to this point. I did not get around to invoices for the Latte pins, so I'd appreciate it if you didn't bail on me if you're on that list. Thanks! Whoops! 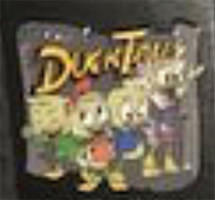 How did I forget the new Ducktales pin!? Jack Skellington and DeputyDonald like this. Jack Skellington and MerlinEmrys like this. If I could be added to the list for the Orange Bird MNSSHP pin please, I would appreciate it. Thank you! Can you add me to Haunted Mansion Hitchhiking Toys please! Oh my golly. I just grabbed all of the open edition. Halloween pins and they are so nice in person!! I'll take some pics when I sit down to lunch. The Mickey and Minnie on the Broom glows in the dark! Jack Skellington, krand1276 and Haunted575 like this. Pickups are done for the day! Got all the Lattes, Halloween OEs, and the Haunted Mansion OEs. Invoices to go out this evening. I do believe so. I grabbed all of the NBC pins too. If you wanted to wait until after the August event, that would be fine, or that can be the start of your next order. 3. Her Jack His Sally pin. Can I please be put down for a DuckTales pin? Thank you.